Turns the set on/off when the ignition switch is on ACC or ON. If the button is turned to the right, it increases the volume and left,decreases the volume. Turns to FM or AM mode, and toggles in the order of FM1 ➟ FM2 ➟ AM ➟ FM1... when the button is pressed each time. • When the [SEEK ] button is pressed, it increases the band frequency to automatically select a channel. Stops at the previous frequency if no channel is found. • When the [TRACK ] button is pressed, it reduces the band frequency to automatically select a channel. Stops at the previous frequency if no channel is found. Manual Channel Selection knob Turn this knob while listening to a radio channel to manually adjust frequency. Turn clockwise to increase frequency and counterclockwise to reduce frequency. In SETUP mode, SCROLL, XM option or TONE, POSITION settings can be adjusted. After selecting each mode by pushing Sound Control knob, rotate the knob to adjust and push again to changes take effect. When "ON" is selected, long file name scrolls continuously while playing. Sound tone(BASS/MIDDLE/TREBLE) can be adjusted by rotating the knob. To select next item, press the knob again. Sound position(FADER/BALANCE) can be adjusted by rotating the knob. FADER adjusts FRONT/REAR position, and BALANCE adjusts LEFT/RIGHT position of the speaker sound. To select next item, press the knob again. Selects default information of channel displayed in XM mode. Category/Channel or Artist/Title can be selected. Exits SETUP mode and returns to play mode. 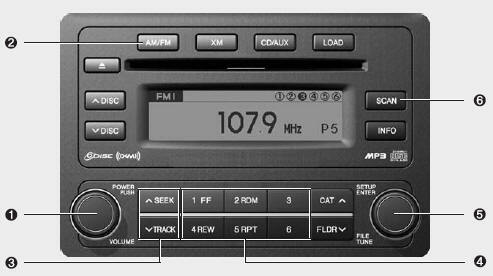 Pressing AM/FM, CD/AUX or XM button also exits SETUP mode and switches to selected mode. If this button is pressed, the frequencies will become increased and receive the corresponding broadcasts. This function will play the frequencies for 5 seconds (XM MODE:10 seconds) each and find other broadcasts as the frequency increases. Press the button again when desiring to continue listening to the currently playing broadcast.